Today I’ve got another book review for you (to be honest, I’ve still got two more to write). Lovelybooks and btb (Random House) provided me with the German Edition of Touch by Alexi Zentner called Das Flüstern des Schnees. I read it in a Lovelybooks reading group where we also got the chance to ask Mr. Zentner questions. If you’re interested in them, just head over there. They are in English :). On the eve of his mother’s funeral, Stephen, a middle-aged priest, sits down to write her eulogy. But as the evening creeps into night, he is haunted by memories from his childhood: birthday trips to the cuts with his father; the moment his sister slipped under the thick winter ice forever; and the memorable day his grandfather, Jeannot, came home after a thirty-year absence with a bundle of bones in his pocket and a mission to raise the dead. 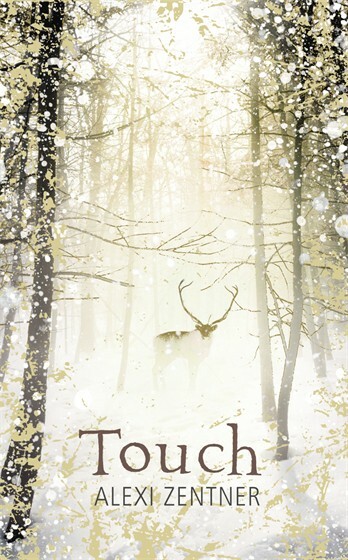 Masterfully weaving the stories from three generations of one family, Touch tells the founding tale of Sawgamet – originally a gold-mining village – where deep in the forest reign golden caribou drinking from a honey-sweet river. Yet also in the forest lurk malevolent shapeshifters disguising themselves as friends, storms raging against foolhardy settlers, and the forest taking back the land for itself, branch by branch and root by root. Touch is a singular, startling debut as enchanting as it is unnerving. In this darkly sinister fairy tale Alexi Zentner builds a magical world as distinctive as a grown-up Narnia, and marks himself out as a real talent to watch. Touch is set in the fictional town of Sawgamet somewhere deep in the woods of Canada. The book spans the life of three generations of a family living there from the second half of the 19th century onwards. I am fascinated by the world that Mr. Zentner created in Touch! You can feel the chilly ice and snow, you can see it glitter. You fear the dark woods but you are also fascinated by how vast they are. And while you walk through them, you can even see your breath against the light shining through the trees. I’d say there are two important characters in Touch, the first one being the narrator, Stephen. The second is his grandfather Jeannot. The reader accompanies Jeannot through many years of his life. He is a tough and fearless man. But it seems like almost all men who come to Sawgamet are tough and fearless. I can’t really remember a feature that would distinguish Jeannot from any of the secondary characters. The same happens with the women in Touch. They are all quite similar. I’d guess this could be interpreted as a means of showing that the characters in the book could be exchanged for anyone. The plot of Touch is very fascinating as it leaves room for interpretation. It is a work of magical realism after all. My theory is that Jeannot fights nature itself, as he came into the woods and took from them. Touch isn’t a book you’ll quickly read and put back on the shelf, it is a book that will make you go back and think about it.